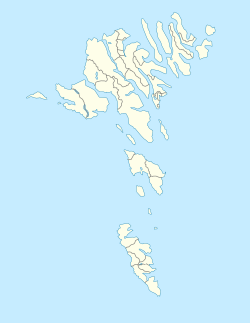 Mjørkadalur is a valley on the Faroese island Streymoy in the Tórshavnar municipality. It has no postal code. It is located on the mountain Sornfelli above the fjord of Kalbaksfjørður. The buildings in Mjørkadalur used to be part of the Island Command Faroes, but now a part of the building is used as a detention for prisoners who serve short sentences. Criminals from the Faroe Islands who serve longer sentences are sent to prisons in Denmark, as there is no prison in the Faroe Islands, only a detention, which has room for 12 persons. It is however also used as a prison for prisoners who serve short sentences. It was the site of a Danish military installation (Island Command Faroes) and NATO early warning radar system until the Danish authorities closed it, and handed the key of the building to the Mayor of Tórshavn on 2 July 2002. The radar continued to work until 1 January 2007. Earlier up to 200 persons from the Danish defense were living in Mjørkadalur. On 15 November 2010 the last equipment was shut down. Since 10 February 2011 the building in Mjørkadalur has been the only detention of the Faroe Islands. It used to be in Tórshavn, but due to problems with mold in the building in Tórshavn, the detention was moved to Mjørkadalur. One of the radars is still operating but it is only watching civilian aircraft traffic in the area. The location is at the head of a valley where the clouds can be seen forming to travel over nearby peaks. Mjørki means Fog in Faroese and Dalur means Valley, Foggy Valley. Considering the dialects in different parts of England, a Yorkshireman might call it a Murky Dale when the valley was foggy. ^ nsfk.org (in Danish) Kriminologiske og kriminalpolitiske nyheder fra Færøerne af kontaktsekretær Karin Kjølbro.